REI, Adventure Medical, and other companies have build quite a market around complex pre-built first aid kits. These kits can come very organized with quite a few components to them. They are often tailored to general circumstances, and contain a lot of potential yet unneeded trash. I believe that first aid kits are very personal and should be customized individually based on your training, your trip, and your expectation of care. I am of the minimalist philosophy. I bring the very basics and accept a slightly lower expectation of care. Of course, any first aid kit must also be accompanied by training. I highly recommend at least taking a Wilderness First Aid course if you are often in the wilderness. Wilderness Medicine Training Center (WMTC), based out of Winthhrop, WA, offers both a blended learning model (with online learning components) and a full in-person model for their first aid courses. They offer trainings around the country, so check out their training schedule for the next one near you. I give them my highest recommendation. All their instructors do a wonderful job. I carry a modified version of the WMTC suggested basic kit with some modifications to include some of the items in their small group kit. I have been receiving my Wilderness First Responder training from WMTC, and in general, I tend to agree with their philosophy. Is my first aid kit heavier than others? Yes. But I have what I need, and I know how to use every piece of equipment in there. So, enough talk, let’s dig deeper into my first aid kit. I’m going to talk you through the general setup first, then give you a detailed list of everything I carry. Let’s start with the bag. 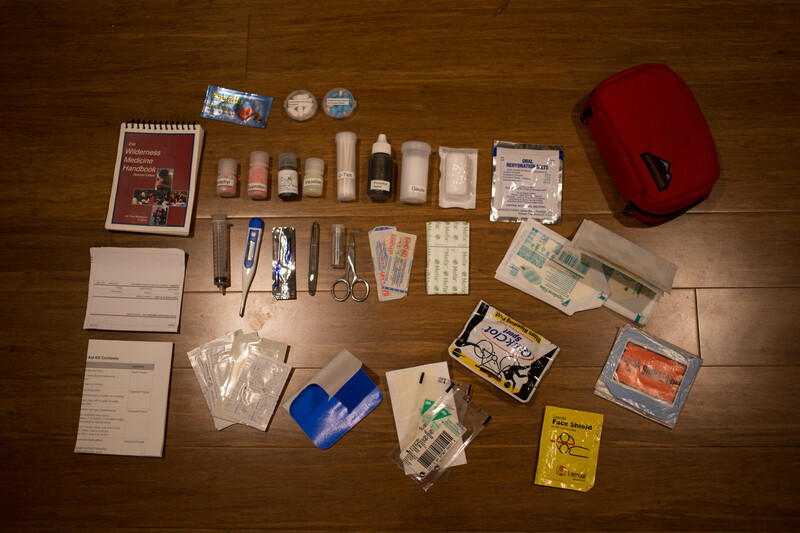 I use WMTC’s Minimalist First Aid Pack. Their theory behind bags is one that is durable and flexible. As such, the interior is taken up by a slash, a zippered bellows pocket, three long spine pockets, and an array of elastic loops. The loops can be moved around and customized to your personal fit. One longer elastic loop is designed specifically for a wound irrigation syringe. Supplies, tapes, and more are stored in the pockets, and the elastic loops are designed specifically for small Nalgenes to store pills, ointments, Q-Tips, and Roller Gauze. 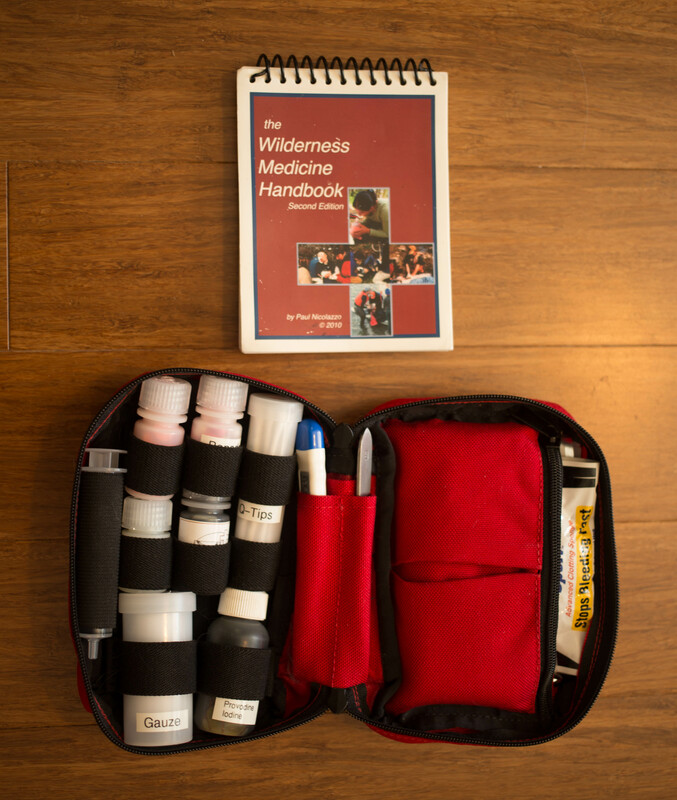 Finally, WMTC’s first aid manual just fits inside the bag, between the Nalgenes and the bellows pocket. The entire kit weighs 1 pound, 6.5 ounces And is quite compact. I do wish that the first aid bag was about an inch or two longer. That would give me enough space to more comfortably fit the extra medications I’ve added and have a little extra room for specialty items for different trips. But, it fits everything I really need. So, now you have the lay of the land, here’s my complete list.In the image above, left to right and then top to bottom.